Dressed from head to toe in black bombazine, Jane Campbell struck a lonely figure as she stood over her son’s grave. 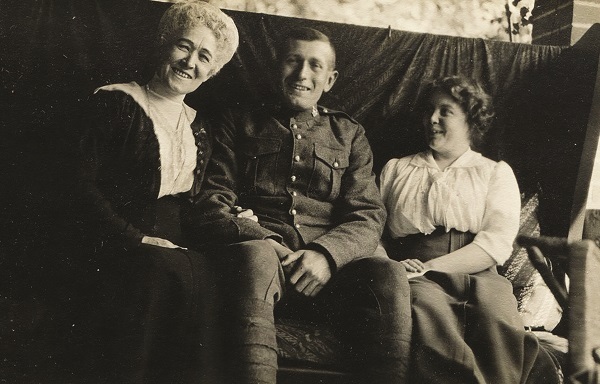 Master Corporal Ken Campbell was one of twenty-four Aurora residents killed in the First World War and Mrs. Campbell was one of the first local mothers able to make the trip overseas to pay tribute to a son who gave his life for King & Country. It is an image that might have receded from Aurora’s collective consciousness in the 97 years since the photograph was taken, but it will live on in the memories of many residents who turned out last Wednesday for Armistice: 100 Years of Remembrance. Held at the Aurora Cultural Centre and produced by the Centre, the Aurora Museum & Archives and the Aurora Historical Society, Armistice Day: 100 Years of Remembrance drew community connections through primary documents like letters and postcards sent home from the front to contemporary newspaper articles. The event was attended by Mayor Geoff Dawe and Mayor-Elect Tom Mrakas, along with Councillor John Abel and Councillor-Elect Rachel Gilliland, and featured these stories brought to life by members of the Queen’s York Rangers Army Cadets, live patriotic music performed by Suzi Wesson and Doug Balfour, and artefacts from the Museum and Historical Society’s collections. In addition, Mrs. Campbell’s story was highlighted by Bill Fleury, a descendant of one of Aurora’s founding families, whose great uncle Herbert Fleury accompanied Jane to Europe – three years before The Great War broke out. In July of 1914, Herbert was once again on his way to France to visit his wife and daughter. Shortly after he set sail, his itinerary was reported in the Aurora Banner, which noted the well-known resident wasn’t expected to return until October. That, of course, all changed in August of that year when war was officially declared. The Fleurys heard the news while travelling south together en route to Switzerland and they hastily returned to Paris. The patriarch was able to secure passage back home to Canada from France by August 28, but his wife and daughter had to take a more circuitous route, first heading to England, travelling northward to Scotland and then catching a ship back to Canada at Glasgow. At war’s end, Mr. Fleury’s regular trips across the Atlantic resumed. This time these trips were not merely to see his family or conduct business; they were also missions on behalf of Aurora residents who lost a loved one in the war who were unable, for whatever reason, to make the arduous journey themselves. “Early in the 1920s, he served as kind of a personal witness for some Aurora families visiting the graves of their soldier sons buried in the cemeteries of Flanders,” said Bill Fleury. “A total of 24 men from Aurora, a town of well under 2,000 residents had died. Tragically, Major Ken Campbell MC, the son of Jane Campbell, who had spent much of his youth in Herbert’s own household was one. 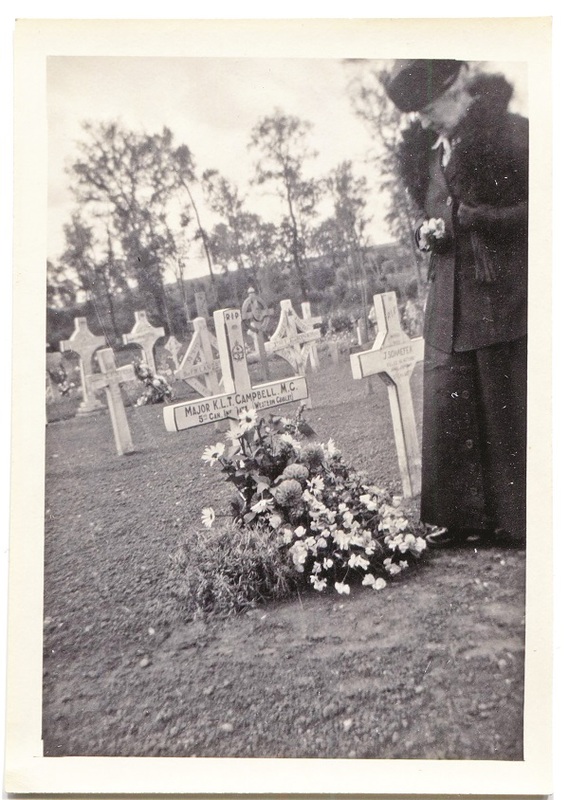 In 1921, Jane accompanied Herbert to Ken’s gravesite. There’s a photo of her stricken and dressed in black mourning clothes laying a wreath of flowers at his rough wooden cross, a cross surrounded by many others in the devastated landscape. The names of both Kenneth Campbell and Ernest Rose are immortalized on the stone cenotaph at which over 1,000 people gathered Sunday morning to pay tribute to the fallen.